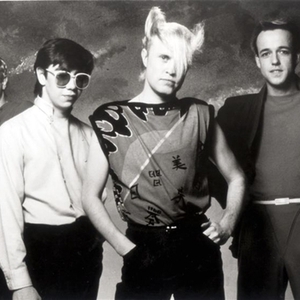 A Flock of Seagulls is a synthpop group formed in 1979 in Liverpool, England by brothers Mike Score (keyboards, vocals) and Ali Score (drums), with Frank Maudsley (bass) and Paul Reynolds (guitar) that gained popularity and subsquently infamy in the early days of MTV with the videos for their songs "I Ran (So Far Away)" and "Space Age Love Song" , in which the latter showcased the lead singer Mike Score's distinct haircut. To this day, they remain firmly identified with their songs from the early '80s. The band split in 1985, and Score reformed the band with new members in 1995. The original lineup reunited for a handful of small club dates in 2003. Since then, Score has performed his version of the band with a fluctuating lineup.